From the very beginning, cars have been equally reliant on fossil fuels and battery power to make comfortable and efficient travel units for people. In fact, any vehicle that is not run by kinetic energy has had a battery of some sort from which to power it. And when we look at the future, we seem to be needing batteries more and more. But of course, batteries cannot sustain themselves. They must be constantly recharged, and when they suddenly give up on you, it can be immensely frustrating and time-consuming to get your vehicle up and running again. Almost every motorist who has driven long enough can relate to at least one emergency situation involving their car’s battery. So when you go online or to a dealership looking to buy yourself a battery-powered vehicle, remember to buy the right battery charger to go along with it. If you are mechanically inclined, this will not be very difficult. However, many people do not know the first thing about how battery chargers affect a car’s battery other than merely charging it up. But as always, the free market has heeded the demand for simpler, more efficient battery chargers and has come up with numerous selections for you to consider. In this article, we take a look at a selection of 10 battery chargers and jump starters designed to make the life of the average motorist safer and much less stressful in emergency situations involving the car battery. Even though the market at present is swarming with numerous battery chargers showcasing remarkable performance figures and longevity, we encourage you to settle for nothing less than the best charger you can possibly find. Listed below are a few important features you should find in a good car battery charger these days. Portability: The leading manufacturers of battery chargers focus on keeping their products small and light which makes them portable and easy to use. Safety: Modern battery chargers take safety standards very seriously and include at least a few safety features on each model to protect users and their batteries from potentially bad accidents. Now that you have a brief idea of what to look for, you can have a look at our top 10 picks for modern car battery chargers. Why we like it: A long-lasting unit able to power multiple jumps starts on a single charge while penetrating through corroded metal. The Clore JN660 is probably one of the most reassuring investments you will ever make. It is focused particularly on giving a jumpstart to your battery with extended cranking power. A single charge is good enough for several jump starts, always a relief in the often stressful situation of a worn out battery. But how does it do that? Well, there are a number of features that make it all possible. First, there is the length of the heavy-duty cable leads. At 46 inches, it is enough to get around most vehicles. Its Hot Jaw clamps are of industrial strength and are able to make a strong connection in spite of any corrosion. Then there is the Clore Proformer battery technology which is all about delivering maximum power with a density and durability to match. So not only do you get some proper and extensive cranking power, you get a long service life as well. Plus, there is fully automated recharging for the onboard battery so you can leave the unit plugged in and ready for an instant jump start whenever you need it. This is by far one of the best chargers available on the market right now. Most customers will not pass it up. Why we like it: An ingeniously designed charging unit that keeps getting better and better with time. We like the Battery Tender Plus despite the irritating digits that make up the rest of its name because it happens to be a cleverly designed and efficient battery charger. It is able to charge up a battery and then keep it at an optimum voltage without sustaining any damage that could be caused by trickle chargers. It can alternate between full charge mode and float charging mode. Obviously, charging time is a major talking point for any customer. 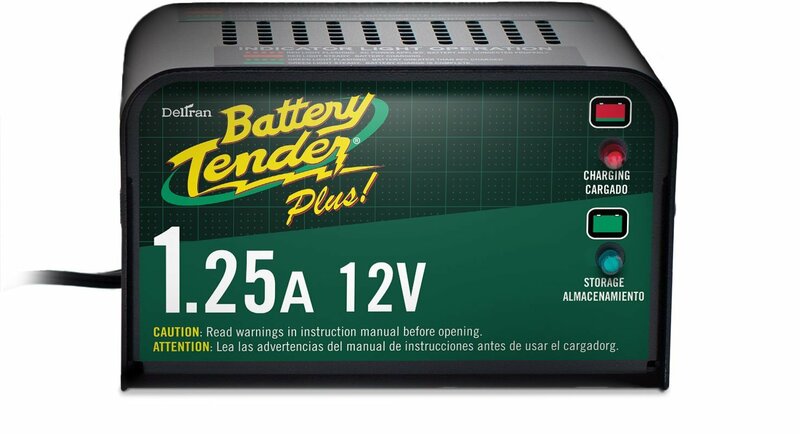 The battery tender is a 1.25-amp charger and will charge your battery a lot quicker than a 3-amp charger would. In the interests of safety, it features a reverse polarity protection feature. The warranty for it is a whopping 10 years. But let us not forget that this is the Plus version of the Tender which means it has 50% more power and consequently, a faster charge than you get from the Junior. This is another important feature especially considering the ever-increasing dependency of modern cars on electronics. The Plus is even better at staving off negative effects of drainage. However, making a really good battery was not enough. The company has already put this battery charger through numerous upgrades in design and software to keep it at the forefront of the market. Why we like it: An intuitive design that combines many useful features to give you one of the safest and most efficient charging services you can find. 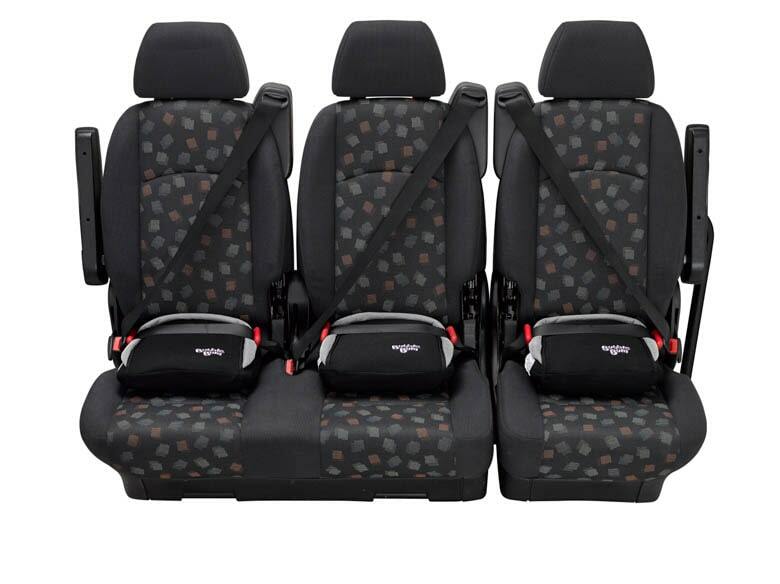 NOCO is a brand that is synonymous with safe and advanced technology and their Genius G3500 is no different. In short, it is a 3 and a half Amp for charging 6 and 12-volt batteries, both lithium and lead-acid, up to 120Ah. It has an impressive range of applications as well from automotive to marine, power sport, RV, and deep-cycle batteries. That gives it a broader reach in the market compared to most other battery chargers. Also, compared to most other battery chargers, it charges batteries twice as fast. It can even repair a damaged battery and work with both CANBUS electrical systems and micro-hybrid start-stop vehicles. It is also hugely impressive when it comes to innovation and safety. With the assistance of an onboard computer, it can actually monitor the activity of a battery to make the charging safer and more efficient. The computer can also help conserve energy expenditure as well as implement reverse polarity and prevention from overcharging. In fact, you can safely leave it connected all day long. The G3500 with all of its strengths and handsome features still manages to fit into a compact, portable, and lightweight design. And if that was not competent enough, it also highly resistant to water and UV rays. Add in a full 5 years of warranty and you soon realize this is not a deal that many buyers would refuse. Why we like it: From a brand that is an absolute customer favorite comes a battery charger that is applicable to a wide variety of vehicles and charges them up efficiently. 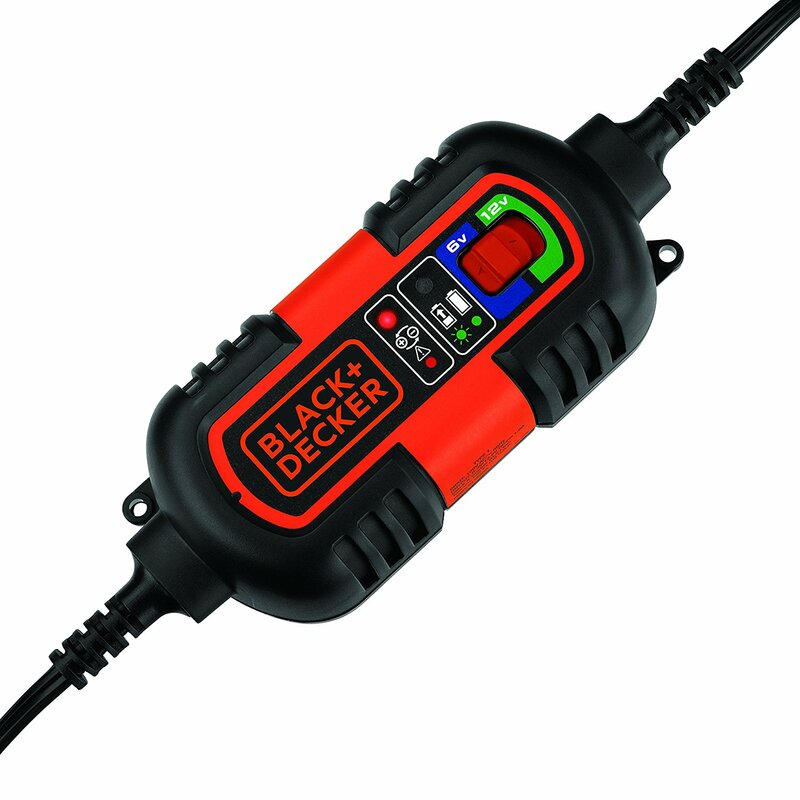 We are certain that a lot of prospective buyers will be delighted to find that Black & Decker is in the market for battery chargers. After all, with such a diverse reach into the tech industry, some may already have a whole collection of household gadgets exclusively from Black & Decker. But of course, consistency with brand names is for rookies. What we are really interested in is whether the BM3B is any good. And we are delighted to report that Black & Decker lives up to their reputation yet again. 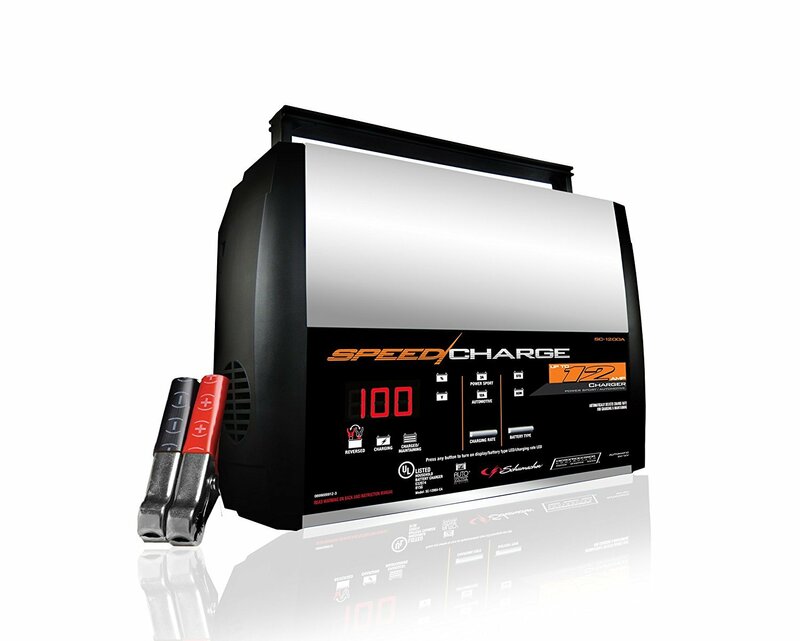 To start with, their battery charger is applicable on a wide range of vehicles including classic cars, motorcycles, RVs, specialty vehicles, ATVs, personal watercraft, lawn mowers – just about anything that runs on a 6 – 12-volt battery system. While you may not need it to charge up all of those things, it is nice to know that you can anyway. What’s more, it does not mindlessly charge a battery even after it is full. It has an integrated circuit that prevents overcharging, short-circuiting, and reverse polarity. Its clever design, coupled with its high usability make it one of the highlights in the modern range of battery charges. Most people would want one. 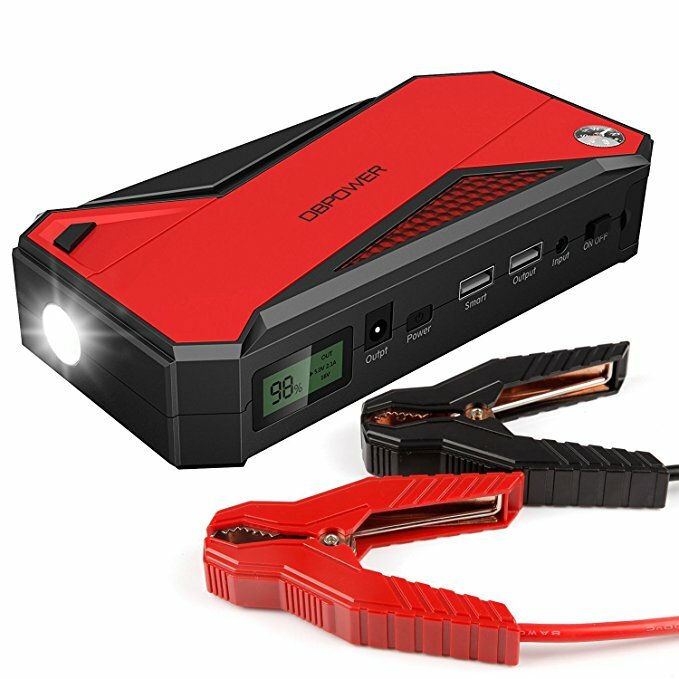 Why we like it: A jump starter kit far more compact than most, it packs a serious punch along with the ability to charge up plenty more than just a vehicle in distress. Nobody likes it when they have battery trouble. 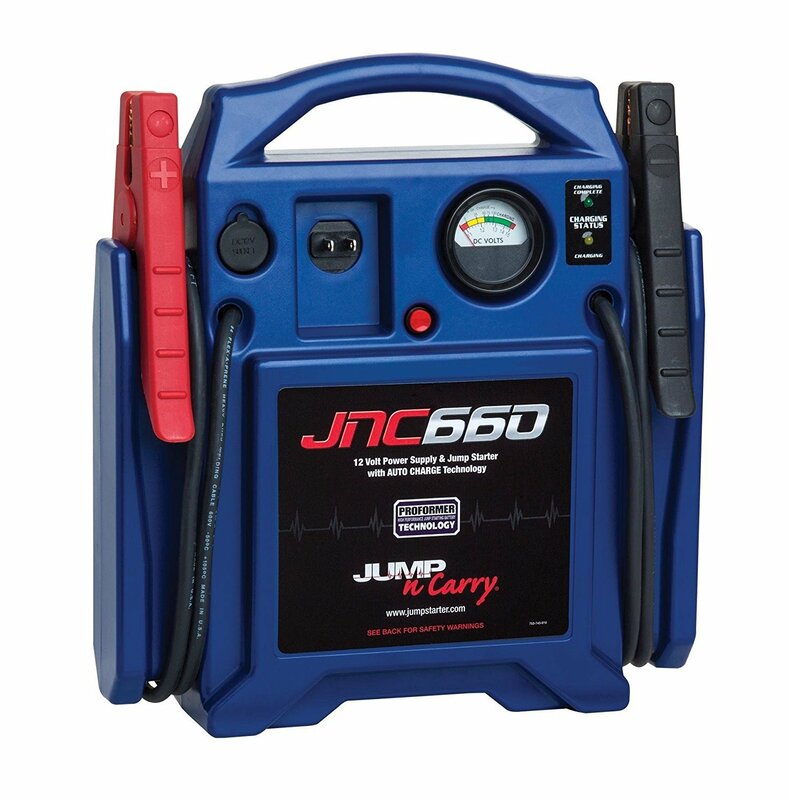 Not merely because performing a jumpstart can be tedious and frustrating, but because a typical jump starter kit is a cumbersome thing to work with as well. 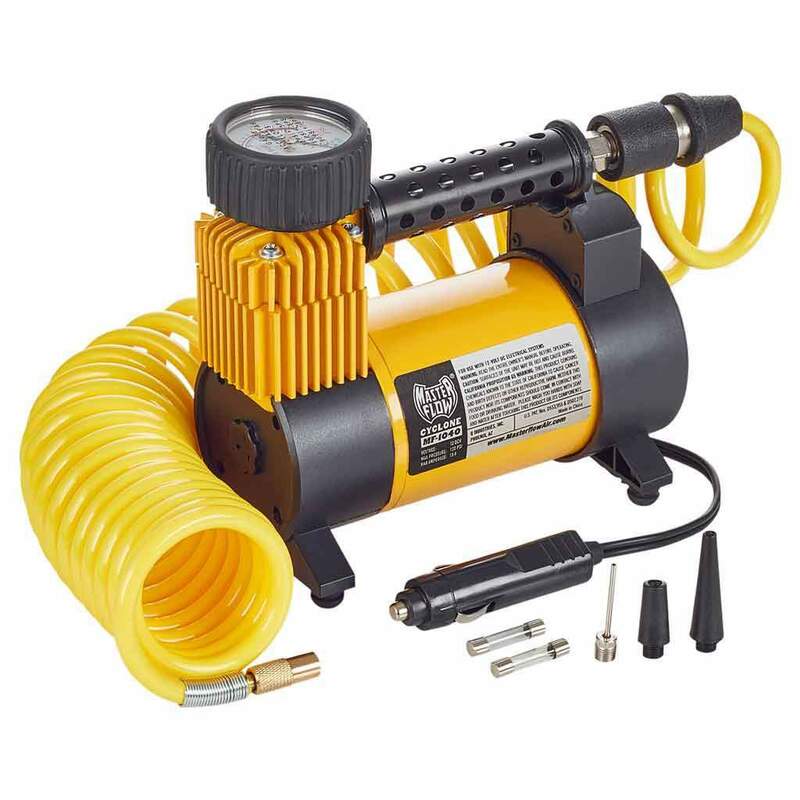 However, the DBPOWER 600A is not your typical jump starter kit. 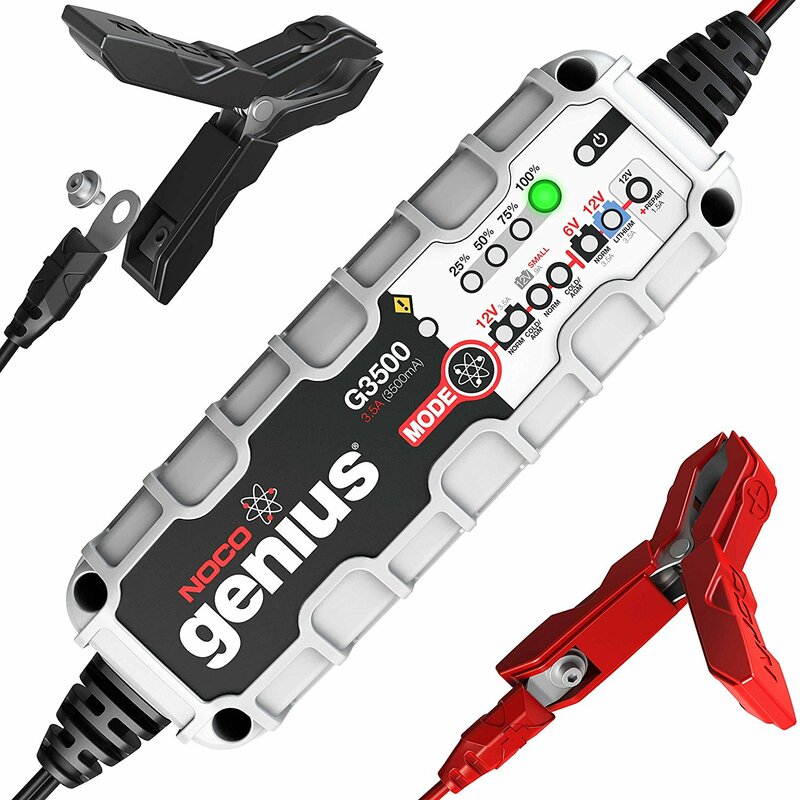 You will know this from the moment you see it because it is much more compact than most other jump starter kits, an easy fit in your car’s glove box, in fact. However, just because it’s small does not mean that it compromises on power. This thing has a peak output of 600 amps, enough to jump-start a 5.2l diesel or 6.5l petrol engine 20 times over on a single charge. And when you do not have to use it to charge up your car – which is most of the time – you can make use of its smart USB port to charge up your other devices – laptops, mobile phones, tablets – the lot. What’s more, it is cleverly designed to avoid the major threats to its performance such as overcharging and short-circuiting. However, not all of its unique qualities are positive. For one thing, attempting to jump start your car with anything less than a 30% charge might prove to be utterly futile. Hence, all jump starts are advised to be carried out on a full charge. Happily, however, you do get a 3-year warranty plan to lean on if the worst should happen. Why we like it: A fully automated battery charger that is equipped with multiple charging modes and compatible many different vehicle types. The Schumacher SC-1200A-CA like many good battery chargers has a rather uninteresting name. But what customers will be interested to know is that it is a fully automatic battery charger that utilizes the latest technology to achieve charging times that are twice as fast as regular chargers. The brain of this unit is a state of the art microprocessor, fully automated and with a capacity of 12 Amp. It can, therefore, detect a voltage that is either 6 or 12 volts. Moreover, it can do different types of charging – 3 Amp to maintain a charge, 6 Amp for a medium charge, and 12 Amp for a super-fast charge. Few others are quite so efficient on power and friendly to the environment. It is not even especially big and is easily portable. Once again, there is no shortage of vehicle types that the Schumacher can be used on. Everything from cars to trucks, marines, motorcycles, ATVs, snowmobiles, RVs, and lawn tractors are all chargeable. Its 50-amp clamps work with both side and top mounted battery posts. LED indicators make it easy to stay updated with the battery’s condition. 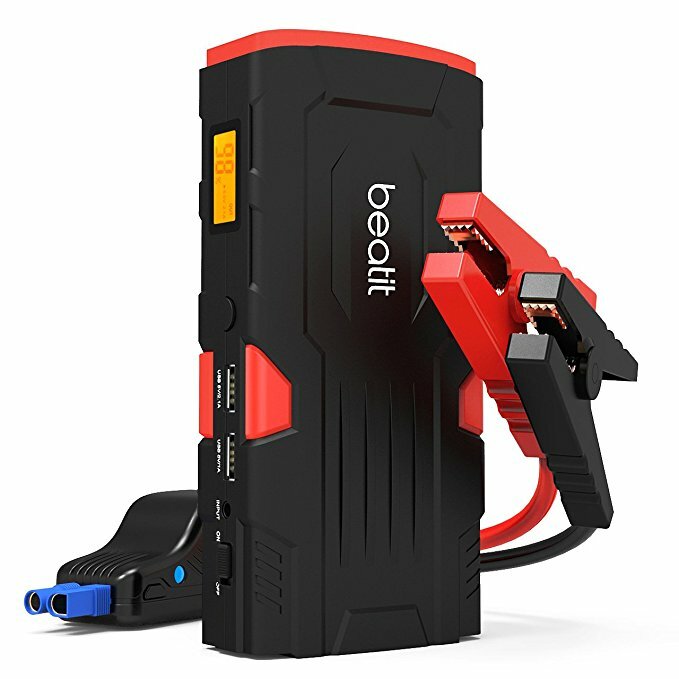 All in all, you are looking at a cleverly designed and competent battery charger that is very likely compatible with whatever you have parked in the shed. 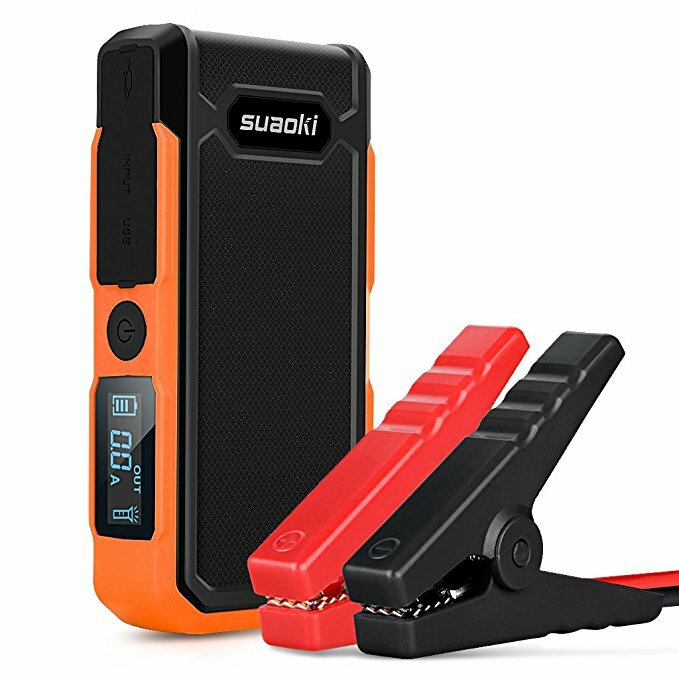 Why we like it: A portable jump starter that is as tiny as it is safe, able to charge anything from your mobile phone to an entire vehicle in very quick time without giving you an unpleasant shock. While some of us could do very well with a battery charger that will jump start virtually anything, most of us are looking for one simply to jump-start a car, motorbike, or motorboat that is giving battery trouble. The Beatit D11 will do it for any of these three, so long as the petrol engine has a capacity of 7 liters or the diesel engine, 5.5 liters. Powered by a lithium battery, a single charge can yield as many as 30 jump starts. That makes the unwelcome emergency of a busted battery far less tedious to deal with. What’s more, the kit is remarkably tiny, able to fit easily inside a glove box or be carried around without causing too much strain. It is also equipped with numerous safety features, particularly against power surges, reverse polarity, and short circuits. And with a capacity of 18,000 mAh, it will need all the safety features it can get. And in case you are wondering, yes, you can also use it to charge smartphones, tablets, and other personal electronic devices in half the time that it would take on a regular charger. LCD lights indicate how much power you have left and the SOS flashlight comes in handy when you are outdoors or in an emergency. You also get a handsome 2-year warranty and a warm customer service. Why we like it: A compact and portable design packed with loads of features that make it both safe and easy to use. It is possible for you to walk past the GOOLOO 800A Peak in a store and thinking its small size could not possibly accommodate any additional features besides the bare necessities. Well, we are here to tell you that on that point, you would be wrong. 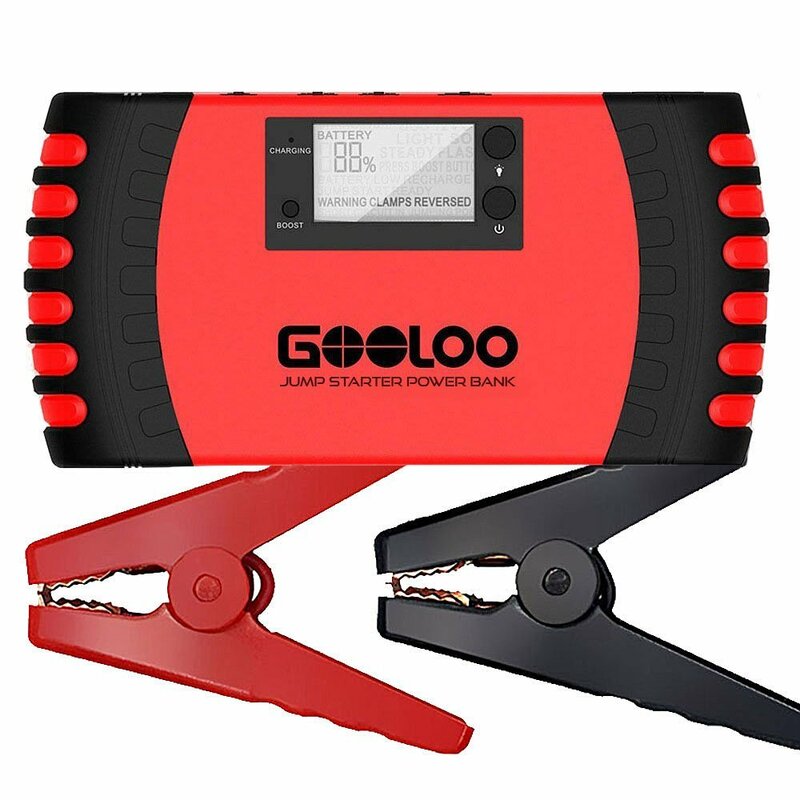 Yes, the GOOLOO is small enough to fit into your glove box or even a smallish bag, but it is still a proper jump starter complete with an LED flashlight, SOS light signal, and 18,000mAh. The GOOLOO is also hugely impressive in the safety department with integrated protection against short circuits, overload, overcharge, and overvoltage. If you find yourself in an emergency situation outdoors, the GOOLOO has an SOS signal flash that will work for at least 120 hours on a single charge. In addition, it also has a super bright LED flashlight with 3 illumination modes. However, there are some things to be cautious about, the temperature for example. The optimum operating temperature for this charger is between -20 and 60 degrees celsius. Also, it can only do 4 jump starts every 2 minutes, not too big a problem if you are a little patient. Why we like it: A fully automated battery charger suited to a wide range of battery types. 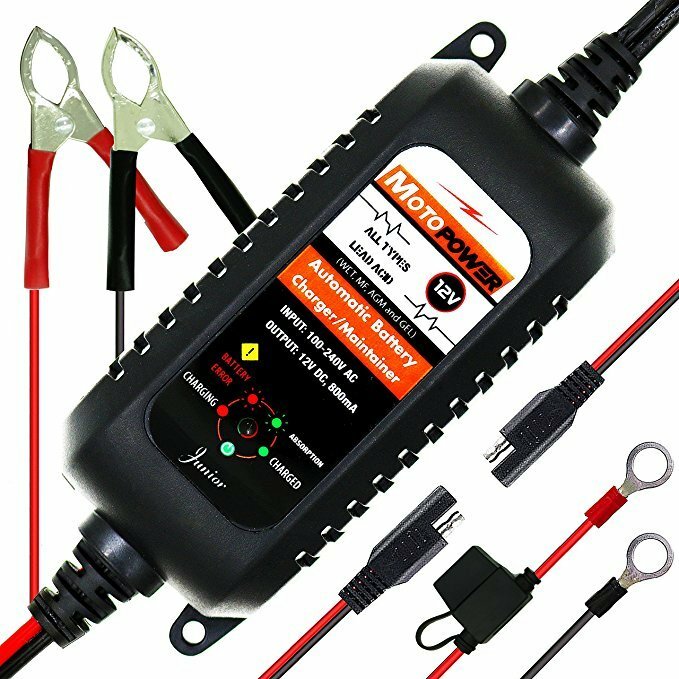 The MOTOPOWER MP00205A has fully automated battery charger that works on vehicles types ranging from cars to motorcycles, ATVs, RVs, boats, Powersports, lawn mowers, and even children’s toys. Of course, being an automatic, there is little to no manual operation needed on your part. Simply plug it in and leave it be. Thanks to special programming controlled by a microprocessor, the charging process is constantly monitored and will be halted as soon as the battery is fully charged. From then on, it will keep track of the battery’s voltage and maintain its maximum charge with a floating current. Of course, there are other safety features in addition to protection against overcharging. Prevention measures have also been taken against reverse polarity and short-circuiting. None of the components will produce any sparks and the Featured Constant Pulse Current Maintenance function prevents against excessive charge or discharge. It will effectively enhance the battery’s lifespan. One other important feature to talk about is the SAE system that gives you a couple of quick release connection options – Ring Terminals and Alligator Clips. Since the ring terminal forms a permanent connection with the battery, you can easily connect the charger via the SAE adapters if necessary. The whole design of the MOTOPOWER based on the efficient use of energy. It is a design that has been certified by the CE, CEC, RoHS, and UL. Customers will get a year-long warranty plan and technical assistance from customer services. Why we like it: A well-made, well-designed battery charger that efficiently charges your car as well as other electronic devices albeit with some limitations. You never know when your battery might sustain a sudden a blackout or run out of power. It is always an untimely case to deal with and everyone’s main goal at that moment is to just get back on the road. Fortunately, the Suaoki U10 800A will get you get you out of those ruts in addition to performing the essential jump-start for your vehicle when necessary. And it is not only your vehicle that can be charged. The presence of two dustproof USB ports means you can plug in your other electronic devices as well. An LCD screen and LED lights are a given here. The screen displays percentage readings of output and battery consumption. The Strong, Strobe, and SOS LED lights each require a single press to be activated while the Red Alarm mode requires a double press. However, not all is quite so well with this charger. For instance, it is not suitable for charging electronic devices that have an output of 12, 16, or 19 volts. Also in the event of starting up the battery, you really do need to make sure that you make the right polarity connection. The clamps are not in any way protected. Whether you are looking for a full-on battery charger or a simple jumpstarter, there are some critical areas to look at before you buy one. If you are a regular driver, you might just buy both for added reassurance. But in any case, it pays to understand the differences between genuine battery chargers and jump starters. So let us now explore the buying guide for selecting the best possible car battery charger. Cars move, so it would be a good idea to get yourself a battery charger that you can take with you on the road. 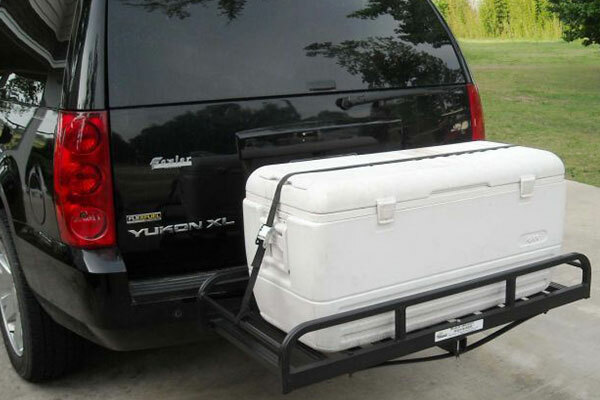 Ideally, it will be able to fit easily inside the glove box or a small travel bag. The current design of battery chargers very much focuses on being compact and lightweight as possible. 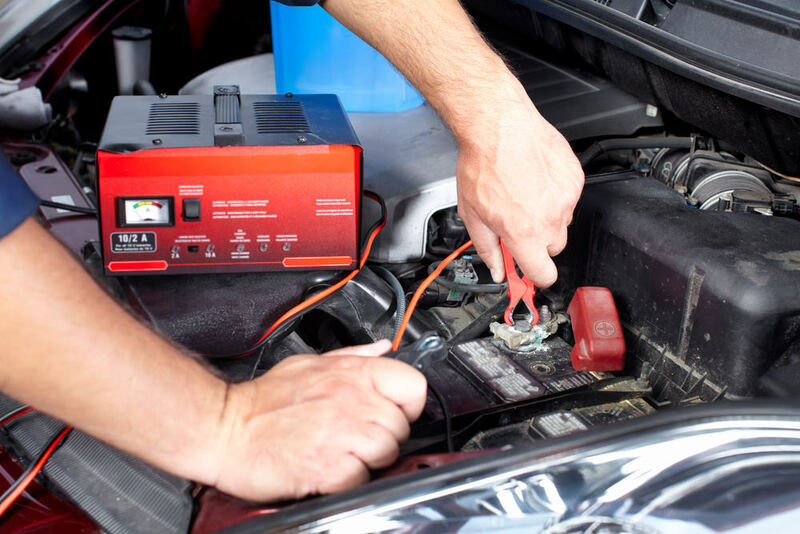 Obviously, not every motorist is mechanically inclined, which is why it is so important to make sure that the battery charger is quick and easy to use. A lot of chargers have been given features such as a light to illuminate a done battery in the dark and LED lights to indicate performance levels. Also, most chargers have been adapted to draw all the power they need from the car’s cigarette lighter. Also, consider whether the charger can be used to power other electrical items such as your smartphone and laptop. A couple of USB slots are always a welcome sight. It would be extremely handy to be able to keep tabs on the battery capacity while charging and to know when it needs recharging. A really good charger should have indicators for this purpose as well as an alarm in cases of reverse polarity. This way, you will always place clamps in exactly the right order. Once again, this is a helpful feature to have, especially for drivers who are not familiar with charging car batteries. The majority of battery chargers on the market draw power from 12-volt batteries. However, in terms of power, these chargers are more variable ranging from 6 amps to about 10 or even 20. A higher amount of amps suggests that the charger is longer lasting and charges the battery quicker. However, more amps also add considerably to the price of a charger. But in a rush hour case, you may find it to be totally worth the additional cost. This is another integral part of modern car battery chargers. The latest version comes with a variety of different safety features to protect drivers as well as batteries. Here some of the main safety features you should expect to find in a good battery charger. Not to worry, no chemistry degree is required here, just a little general knowledge. What you need to know is whether your battery is a standard lead-acid battery or a deep cycle battery and whether your charger is compatible with it. Automatic chargers are catching on quite a bit now as they do not require drivers to keeps frequent tabs on the amount of charge the battery is receiving. As soon as the battery is fully charged, they will switch modes to prevent overcharging, thus improving battery life.